The Boston Club, founded in 1841, is the oldest social club in New Orleans and the third oldest in the United States. The club has long abandoned the card game it was named after, but remains an exclusive private club for a limited number of men of high social and business standing. While the club has hosted a number of annual events over its history, including New Year’s Eve and club anniversary dinner-dances, its Mardi Gras traditions are legendary. While the Hermes and Comus viewing parties and festive lights and decorations were widely praised, it was on Mardi Gras Day that the Boston Club shone the brightest. Closely tied to the Rex Organization (one doesn’t have to be a member of the Boston Club to reign as Rex, the King of Carnival, but it might help), the Boston Club set up viewing stands on Canal Street every year starting in the late 1800s to provide a place for the Queen of Rex, her court and various esteemed guests to view the parade. Upon arrival at the Boston Club, the King’s float would stop and Rex would make a champagne toast to his Queen, presenting her with a purple, green and gold bouquet of spring blossoms, and then thank the club for their hospitality. 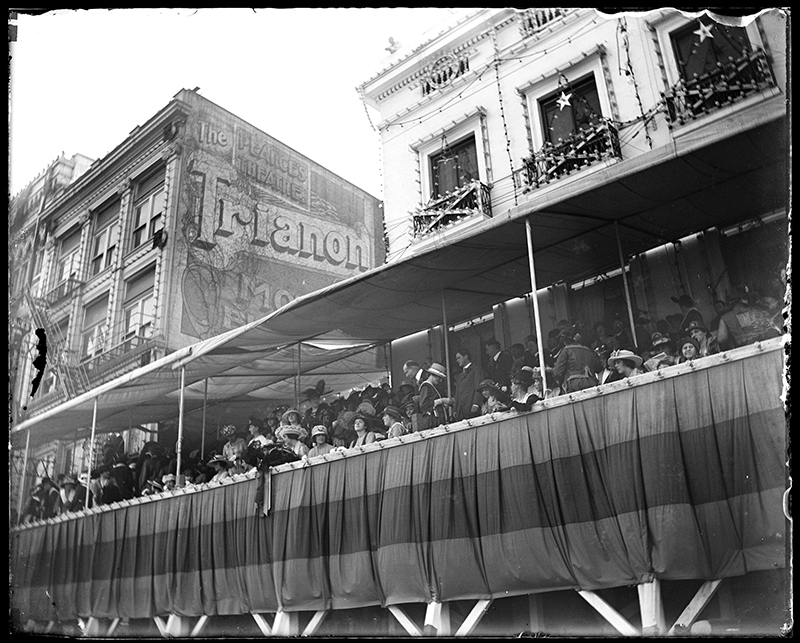 When radio and television joined the Mardi Gras celebrations, they set up across from the Boston Club stands to capture this treasured Carnival tradition. It was the most photographed event at Mardi Gras for decades. In 1992, the club declined to erect their viewing stands as protest against the city’s newly instituted bias ordinance, concerned that the stands would present them as a public accommodation rather than a private club. While they were later victorious in their lawsuit against the city, Rex had already accepted the formal invitation, delivered by limousine, from the Intercontinental Hotel on St. Charles Avenue to make his traditional toast there. It continues at the hotel today. The Queen of Rex in the viewing stands in front of the Boston Club in 1917. The club occupied a few different locations in downtown New Orleans until 1884, when it moved into the Mercer Mansion, designed by James Gallier Sr. Located at 824 Canal St., The Boston Club still calls it home today after purchasing it in 1905.